Answer: When it costs you more than you anticipated. 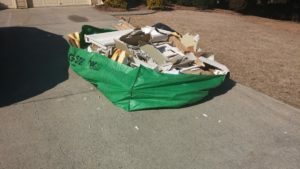 Our 10 yard dumpster is $240 inclusive of all fees. A bagster is $29 for the bag and $129 for the pickup, which totals $158. But the Bagster only holds 3 yards. Just on that comparison alone, you are making a costly decision. Our 10 yard is $24 per yard whereas the Bagster is $52 per yard! That mistake is compounded when you under estimate your volume of debris like this unhappy homeowner in the photo. They are demolishing their master bath and quickly realized that they will need to buy another bag and order another removal. Their total bill now is $316 for 6 yards of debris. Our 20 yard is only $325, but they didn’t even need a dumpster that large. All they needed was a single 10 yard dumpster for $240 and they’d be ahead of the game financially and logistically. 10 yard dumpster beats a 3 yard Bagster every time.